Provide comfort for the family of Halia Kotylak with a meaningful gesture of sympathy. It is with great sadness and a heavy heart we announce the passing of Mrs. Halia Sylvia Kotylak (nee Pawluk) who was a loving daughter, sister, wife, mother, grandmother, great-grandmother, and friend on January 26, 2019, at the age of 83 years. Halia is survived by her two daughters, Jackie (Darren) and June (John), all of Edmonton; six sons, Larry (Kim) of Edmonton, Chris (Darlene) of Lac La Biche, Don (Roberta) of Whitehorse, YK, Willie (Erin) of Beaumont, Marshal of Edmonton, and Eugene (Kerry) of Ottawa; and her sister, Gloria. Predeceased by her husband, Harry; parents, Joe and Evelyn Pawluk; brother, Wilfred; and sister, Sonia. Very special thank you to the staff at the George McDougall – Smoky Lake Healthcare Centre for all their care and compassion during Halia’s final days. 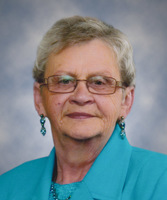 Funeral Service Friday, February 1 at 10:30 a.m. at the Waskatenau Community Centre, 5104 – 50 Street, Waskatenau. Reverend Father Michael Maranchuk officiating with interment in St. Volodymyr Ukrainian Orthodox Church Cemetery, Waskatenau. Memorial donations can be made in lieu of flowers to the Canadian Cancer Society, Alberta/NWT, Edmonton Division, #201, 9452 – 51 Avenue, Edmonton, AB T6E 5A6. We encourage you to share your most beloved memories of Halia here, so that the family and other loved ones can always see it. You can upload cherished photographs, or share your favorite stories, and can even comment on those shared by others.